Drones or UAV as a service is the new trend in construction that is being used in many projects around the world, offering multiple benefits. Imagine that your drone can be connected to a cloud-based platform and all information is captured and gathered instantaneously to your server; sounds nice right? Well, that is the type of service that leading tech company Drone SmartX™ is offering builders and contractors almost everywhere. This company offers a product that is added to their UAV/drones to convert them into "Smart Drones." 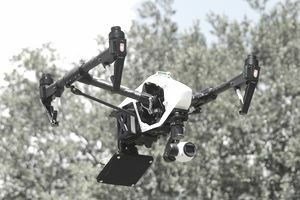 The company, through their UAV SmartHub™, allows customers to connect to Smart Sensors, such as RFID and Bluetooth 4.0 devices, on the field, capable of capturing data and storing them in the cloud platform. The hub can be attached to almost any commercial drones available in the market, meaning that existing drone companies can use their existing drones without having to acquire new equipment or other drones. The product right now can be used on multiple platforms, such as Windows, Android, and Linux. All data is provided in different reports and/or formats that can be customized and filtered with user-defined layouts that will allow you to export data, create different user views, as well as filter, sort, and group data. You can group data by categories, asset groups, sitemaps, user-defined permissions and rights to access the data. Different alert notifications, permissions, and restriction of sensitive data can be used to control and keep information confidential as needed. Contractors and builders are using this technology as described in the following sections. How Does Smart Drones Help in Material Tracking? RFID ( Radio-frequency identification) and smart tags are proven solutions (using electromagnetic fields to automatically identify and track tags attached to objects) for real-time tracking of material, equipment, and other building components. This technology allows for control and precise functionality of equipment being used and installed at the site. When this technology is combined with smart drones, it will improve traceability, reduce project delays, minimize rental losses due to misplaced parts and equipment, improve logistic planning and helps to locate assets on a sitemap using real-time data. Not only for material tracking, but the platform can be used in conjunction with RFID, so it can be used to perform operations in challenging conditions, weather-changing environments, mines, construction sites, or even inaccessible locations. By taking advantage of the smart drone systems, employees can be notified of possible and potentially dangerous conditions and situations that can harm your workforce. It can also be used to keep attendance records and monitor workers on site and is a convenient tool to keep track of how many employees are working in sensitive or hazardous areas. The 'smart drone' platform can be used to map your tools, assets, and workforce in the designed area, providing a real-time overview of all critical building components of the project in a helpful, graphical, easy to read format. A powerful visualization tool, the UAV SmartHub™ Map, provides access to all key project areas allowing management and construction staff to monitor productions, operations, and performance so decisions can be taken to increase efficiency while providing data that will help during the decision-making process. Integrate all mapping and other data into one single platform. When you combined both systems, mapping and other data files from your project, it will save time and produce detailed and faster results, instead of having to deal with different platforms to gather different data simultaneously.